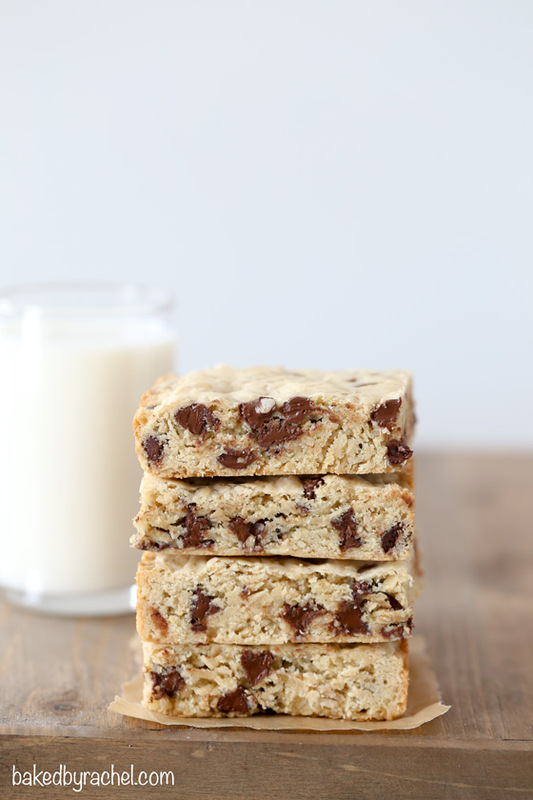 Soft and chewy oatmeal cookie bars with chocolate chips throughout! A simple dessert, perfect for any occasion! My birthday is in less than a month. Even though I’m guaranteed to be less excited when my birthday actually gets here, right now I’m having fun thinking about it… do I want cake or pie? That’s the most important decision. Everything else can wait. I always say I’d love pie, because I do have a serious love for pie, especially apple pie. But I like cake too. Cake is fun and traditional and less work in many ways, but pie… is pie. It needs no explanation, especially if you know my love for apples… huge love. Somehow I never seem to remember that I’d actually love pie when we get to my birthday week. The funny thing is, my Dad’s birthday is the week before mine, which means I’ve never forgotten when his birthday is. But also…last year, he requested pie for his birthday. Clearly we’re related. I’ve never met anyone else that wanted pie for their birthday instead of cake. Have you? I could seriously go either way here. A really good cake hits the spot but so does pie. So tell me… would you choose pie or cake and if so, what variety? I’m in brainstorming mode and would love some fun ideas! If I’m given the option between a cookie or a brownie, I’ll almost always choose a cookie, especially if it’s chocolate chip. However, if it’s an oatmeal raisin cookie vs a brownie, I’d be team brownie all the way. I’m not a fan of raisins and they have no business being in my food. Ever. Thus, oatmeal chocolate chip cookie bars … or cookies. Because… never ever ever will I willingly put raisins into my desserts these days. For special occasions and requests, absolutely. But never if I have any intention of eating them myself. I have strong feelings about raisins. Clearly. Because I haven’t made cookies in a while, or any blondie bars for that matter… I decided to combine two of my favorite things into one incredible (and super easy) dessert! Your favorite chocolate chip oatmeal cookies baked into chewy bars! No dropping or scooping. Press, bake and slice. Cut to serve just a few, or a lot! Perfect soft and chewy oatmeal cookie bars, packed with chocolate chips! 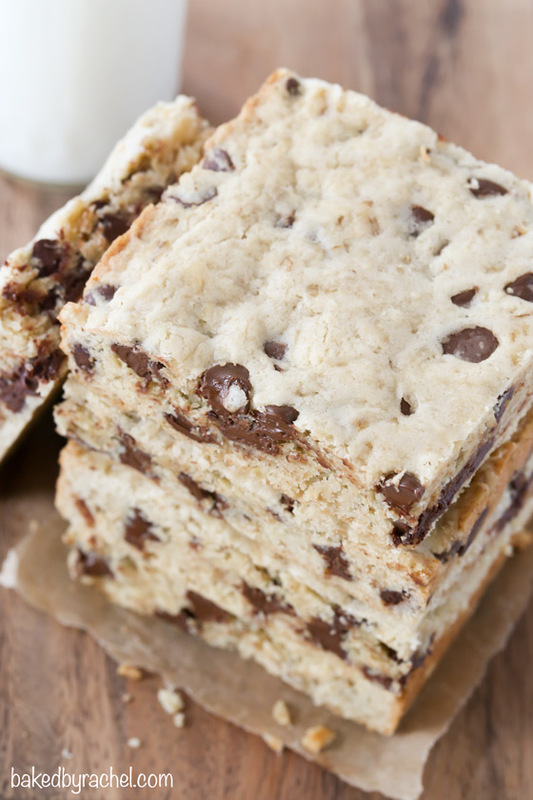 If your family is anything like mine, they’re guaranteed to love these easy cookie bars! Add these to your must bake list! Line a 9x13-inch baking pan with parchment paper, leaving overhang on two sides. Lightly grease exposed pan sides. Set aside. In a large bowl or stand mixer, cream together butter and sugars until light and fluffy. Mix in eggs, one at a time, followed by vanilla, salt and baking powder. Scrape bowl as needed. Add flour in small batches until fully incorporated. Stir in oatmeal and chocolate chips by hand. Transfer to prepared baking pan. Press down into an even layer, spreading into all corners. Bake for 25-30 minutes or until a toothpick inserted comces out clean. Cool completely in pan. When bars are fully cooled and set, carefully remove bars by pulling up and out on the overhanging parchment. Carefully cut into 12 or more equal pieces. Store in an airtight container for up to a week. 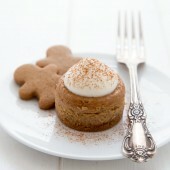 I will take an entire pan please :) These look delish and I can’t stop starring! I do know of a friend of a friend who likes pumpkin pie for his birthday. But that’s it. Just you three. ha ha. I am team cake. And I love yellow cake with cream cheese frosting with coconut on the outside. Thought to be honest I haven’t had a birthday cake of my own in years. Love these bars Rachel. So classic and simple. Haha I’m okay with that. More pie for us ;) And thank you! My grams used to make me a cherry pie on my birthday when I was a kid. I’m still not a huge fan of cake (crazy right?). The cherry pie was made with super tart cherries picked off her cherry tree and canned the year before. Yum, now I want PIE! If it was my birthday I would probably have both pie and cake, you should probably do the same! :-) These bars look so chewy and perfect. 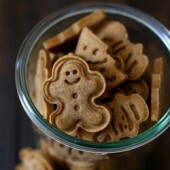 I can definitely see myself eating a couple with some vanilla ice cream! That sounds like the perfect solution – both! And thank you! I love this either or choice with dessert. I am right there with you on the cookie unless oatmeal raisin. Haha! I would love these bars. Happy Birthday Month! I am a cake girl – but there’s no denying the allure pie has too! But, how about a cake-pie – half cake and half pie? That would cover all the bases eh? 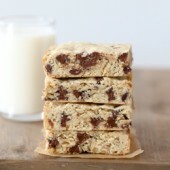 BTW- these cookie bars look insanely delicious – heck I wouldn’t mind having a sheet of these for MY birthday! These sound so amazing! 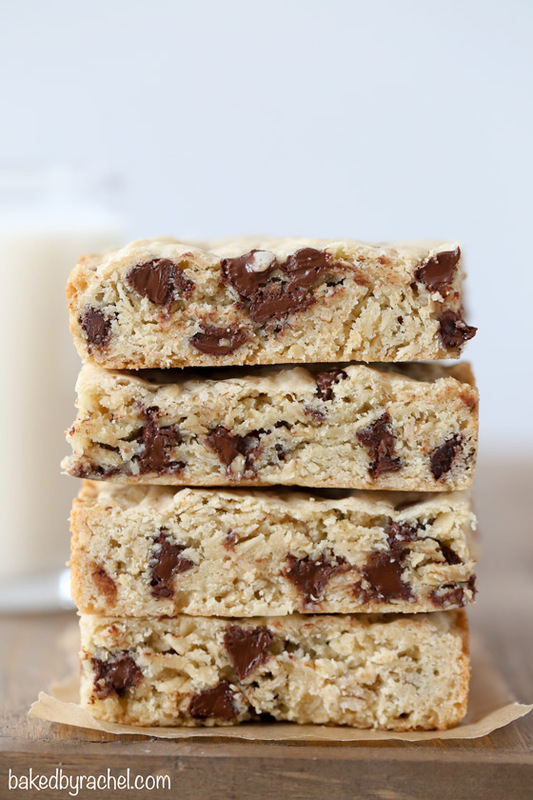 Oatmeal chocolate chip are my favorites, I NEED to make these! Thanks Megan! And you absolutely do! This is genius…cookies are also my guilty pleasure. I think if I’d have to choose between cookies and brownies, I might just take something along the lines of a cookie brownie!! Ha! Can I use regular oats instead of old fashioned? 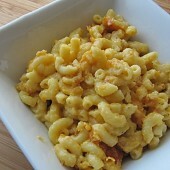 I would only recommend old fashioned oats for this recipe.